So as you can see I created an account for RU27! I will share the account info with everyone so we can all speak for the glider. 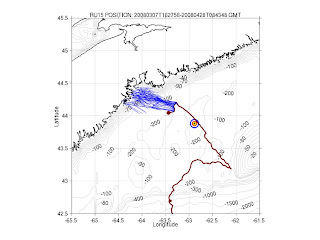 This is a plot of ballast pump position for ru17 during its test deployment off NJ in August 2007. 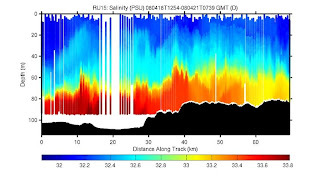 This is a plot of ballast pump position for ru17 during its long duration test from December 2007 to January 2008. 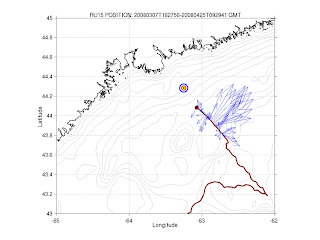 This is a plot of ballast pump position for ru15 during its flight from NJ to Halifax. You can see that the ballast pump is way past the nominal value of +230 lots of the time. The plots of 17 look good. The plot of 15 looks bad. 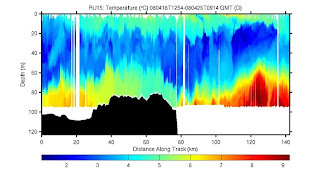 This is the initial analysis of the data taken collected by ru15 on its trip to Halifax. This is a plot of ballast pump (cubic centimeters) as a function of time. Note that the pump is measuring past it's specified position of + 230 cc. 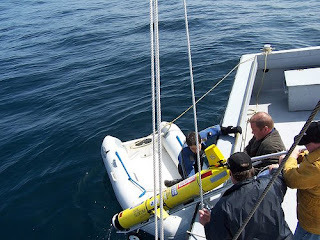 This could be electrical noise in the system while the glider is at the surface. Or could the ballast pump be actually at those positions? This is a plot of m_battery as a function of time. 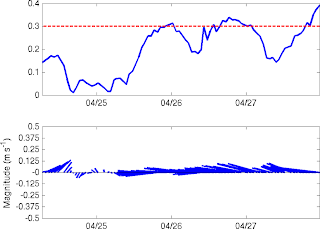 You can see the voltage increase when we get into the gulf stream. This a plot of m_depth versus time. 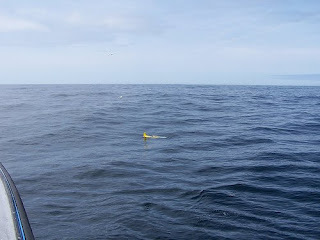 The glider took some time heading out over the shelf in the beginning and then was in 100+ meters for the rest of the deployment. 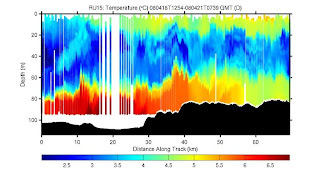 This a plot of temperature measured by the ctd for the deployment. 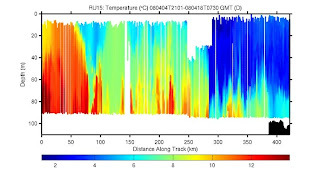 Most of the time in water < 10 deg C.
This a plot of temperature measured by the sensor inside the glider. 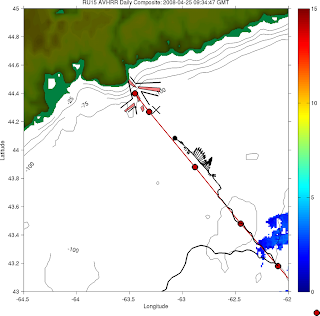 The spike at the end is when the glider was sitting at the surface waiting to get picked up by the Halifax crew. 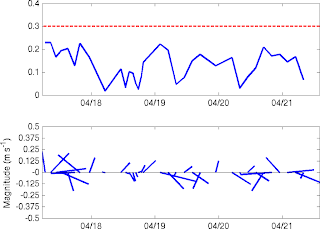 This is a plot of sci_water_temp in blue and m_vehicle_temp in red. The vehicle is a little warmer than the surrounding water. This is a histogram of the pitch angle on climbs. The glider was at the optimal pitch angle the majority of the time. This is a histogram of the pitch angle on dives. The glider was at the optimal pitch angle the majority of the time. Shortly after the last blog entry, we had some surprizing news from RU15. On one of its descents, it looks like the buoyancy pump got stuck. 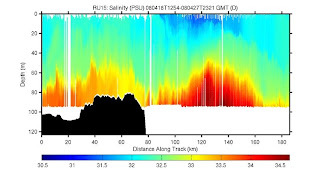 RU15 was descending, and went below our normal working depth of 100 m.
Realizing it was approaching is maximum depth of 200 m, and it wasn't making any progress with moving its buoyancy pump, the robot decided to jetison its safety weight, and make an emergency ascent. When RU15 got the surface it phoned home and told us what happened. 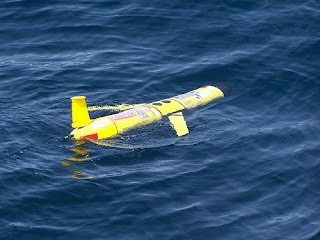 it would now remain on the surface and await recovery. 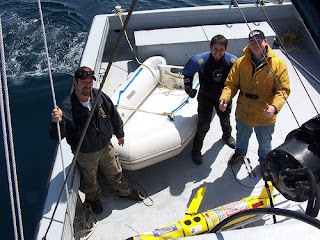 Scott McLean and crew had the Divecom III standing by for a pickup. The the recovery team was assembled, leaving early monday morning, April 28. First sighting of RU15 since its deployment on March 7. What a great feeling to get that phone call over the Iridium sat phone that the glider is in sight. RU15 off Halifax. 53 days and 2600 km after deployment in New Jersey. Scott McLean hooks the glider tail with Marlon's glider catcher. Once the glider is in the recovery cart, everyone pulls. Crew and robot are all safe on board. Two thumbs up! Our favorite call on the sat phone - "The bear is in the igloo!" Thanks to the fantastic crew in Halifax. You brought this first I-COOL mission to a successful completion. 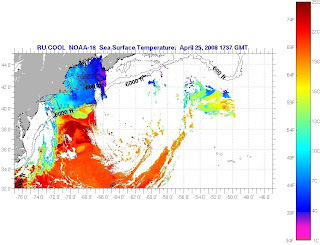 Satellite Sea Surface Temperature (colors) image shows the clouds (white) associated with the weekend storm. Strong currents to the west blowing us off the Halifax line. New waypoint set for offshore, HL3, perpendicular to the currents and back to the line. Currents are stronger than we can fly against. Just have to wait them out. Temperature section shows the surface layer deeping with the storm. Fresh water at surface looks to be mixed with the water below. We just completed a work week's worth of flight tests on RU15 while coming in along the Halifax line. 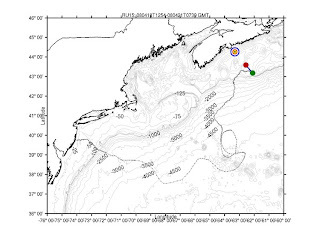 Some watching closely will noticed that we slowed down a bit midweek, even though currents were slow. We were testing the buoyancy pump. Instead of pushing and pulling a full cup of water, we tried smaller changes in buoyancy to see how the energy savings would effect our flight characteristitics. Pulling in less water slows the glider and saves energy on the pump, but then it takes extra time to get somewhere so you burn energy just keeping the lights on. The tests will help us optimize the settings for long duration flight. We are now back up to full speed. The deep basin off Halifax turned out to be an excellent test bed. Water over 100 m deep that is so close to shore. So we took advantage of the natural topography on the way in. We are now half way between HL3 and HL2. We moved the HL2 waypoint a bit to the northeast so that it is in between the shipping lanes. 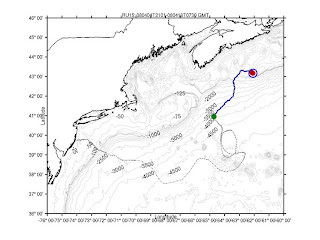 RU15 is now set to just bounce back and forth between the point between the shipping lanes and HL3. We'll keep this pattern going for several days. We'll keep one eye on the battery and the other on the weather. Scott & Marlon have all the equipment for recovery and a boat ready when its needed. Currents are small. We need to line up that strong current jet to the northeast with some of the features in the temperature and salinity sections below. Temperature section inbound on the Halifax line. Three layers. We really like the deepwater test bed we found on the way in. And Salinity. The surface is freshening. RU15 made fine progress along the Halifax Line over the weekend. We are now 95 km from HL2. The SST image again highlights the advantages of an approach from the southeast. We are in the warmer water, that appears to head towards shore along this line and on the upshelf side. On the downshelf side of the Halifax Line, colder water appears to be heading south, against the direction we would want to head. Currents remain low, 5 to 20 cm/sec. 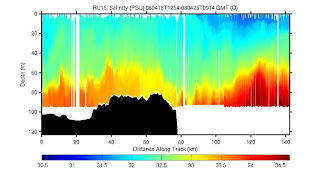 Following Temperature and Salinity Sections are along the short piece of the transect indicated by the green (start) and red (stop) dots. We are crossing over the bank, and will be crossing back down the shoreward side as the day goes on today. 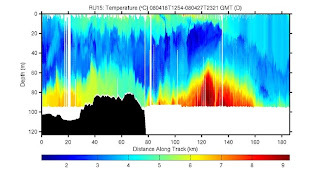 Above temperature section starts on the offshore side of the Halifax Line near HL4 (green dot above) and heads in towards shore. 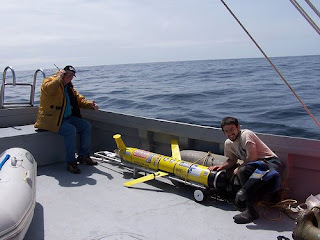 Nearly 70 km has been sampled. Three clear layers. A warm surface layer (5C), cold middle layer (3C), and warmer bottom layer (6C). As usual, plenty of fine scale structure for the modelers to average out. The location of the bottom showing the bank is indicated by the black color filled area at the bottom of the plots. Salinty is also three layers, surface (32.2), middle (32.6) and bottom (33.4). RU15 hit the HL5 waypoint this morning and is now turned and heading towards Halifax inbound on the Halifax line. Currents are low, we are running about 10 cm/sec or less. About 140 km to HL2, so about a week. Batteries still looking good, as far as you can tell. Time to settle into a scientific sampling section to go with the shipboard data currently being collected. 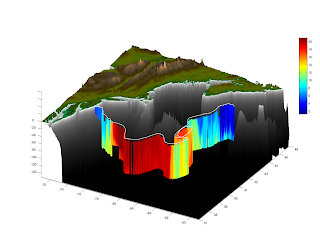 Here's once example of the 3-D view of the full dataset so far. We'll be presenting this to K-12 teachers at tomorrow at Liberty Science Center. They have an activity to build their own gliders out of legos and stuff. 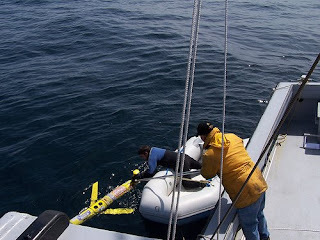 NJNetwork is going to film our undergraduates with the gliders on wednesday next week. They asked for copies of any video or stills taken from the deployment or recovery. Finally our students will be presenting their work on this flight to the public on the Ag School's Field Day next saturday, which is near the time we can start thinking about recovery. NOAA asked for a quick 100 word write up for their newsletter. We have some great I-COOL stories to share. Thanks again to our Canadian partners. so we'll see how that develops. 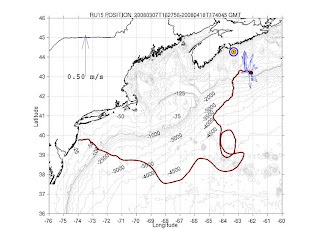 Currents have remained low, so its not as critical as it was in the Gulf Stream region. Here is the nearly final section that started when we left the Warm Core Ring, crossed the slopewater and shelfbreak, and made our way east to the Halifax line. Almost there. Once we hit HL5 and make the turn, we'll start a new section on the webpage and configure things for a standard cross-shelf line. There is a shipboard cruise going on right now, so we hope to contrinbute some scientific data to that project on the way in. 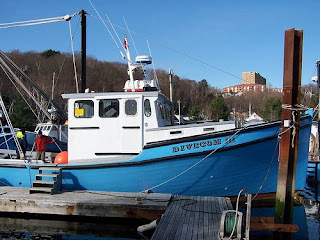 A new area for us, but we benefit from a lot of local knowledge up in Halifax. Thanks again to all up there for sending their help to bring this thing in.